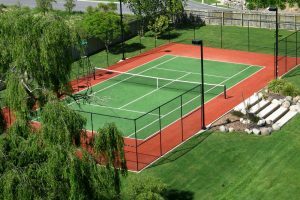 We have a versatile, durable and hard wearing range of artificial turf playing surfaces that are designed specifically for sport grass fields and courts – this includes hockey, soccer, netball, tennis, basketball, rugby, cricket and golf. Manufactured in New Zealand from high performing TenCate fibres and backings, the UV protected turf is designed to withstand harsh weather and heavy wear and comes with a manufactuer’s warranty. Our turfs are tested to meet the highest performance standards required by World Sporting Bodies including FIFA, IRB, FIH, ITF and World Bowls. Our artificial sports turfs significantly reduce the negative qualities of natural grass fields, such as high maintenance costs, cancelled games, and the risk of becoming injured from uneven ground. This is ideal for sports clubs, residential use, schools, parks, stadiums and recreational facilities. They can easily be installed over existing court surfaces. We will provide the complete installation.